Mario Draghi finally announces quantitative easing, but will €720bn a year be enough? It happened. Finally. 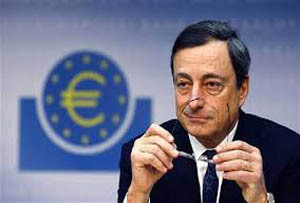 The European Central Bank (ECB) has announced a huge programme of quantitative easing (QE) at its meeting in Frankfurt. ECB president Mario Draghi said the central bank would make €60bn (£46.2bn) purchases of public and private sector assets a month, until at least September 2016, in an effort to get Europe's stagnant, deflating economy going. Expectations had been feverish in the run up the announcement, following hints from Draghi that it could begin soon. The €720bn amount might disappoint some, however, following rumours of a €1.1tn a year programme. Indeed, yesterday OECD secretary-general Angel Gurria went so far as to say it shouldn't be capped at all, but rather be 'as far as we can, as far as we need it'. The lower figure likely reflects a concession to Germany, which has opposed QE on the grounds that it would encourage Mediterranean profligacy and expose the more prudent nations (Germany) to risk. Perhaps in an effort to sweeten the pill, Draghi also announced that 80% of the risk of losses on QE bond purchases will be assumed by the national banks. So Europe finally has QE, but what will it achieve? QE is essentially a way of lowering the interest rate below zero by flooding the financial markets with liquidity. The ECB will create (but does not literally print) money and use it to buy back government bonds. This is essentially the same way that it usually lowers the interest rate, except that QE targets the bonds held by banks and institutional investors like pension funds. The idea is both to reduce bond yields and free up funds so that these big, conservative players will put their capital into more economically stimulating places like options. In the Eurozone's case, the increase in the supply of Euros should weaken the common currency, helping growth (by making exports more competitive) and tackling deflation (by making imports more expensive). Everybody wins, right? If only it were so simple. Opinion is divided over whether QE will achieve its desired goals in Europe. 'I'm all for European QE,' renowned Harvard economics professor Larry Summers said in between meditation and Will.i.am speeches at Davos, 'but it would be a mistake to see European QE as a panacea'. Summers believes Europe will not respond as well to QE as the US, which the IMF predicts will growth more than 3% this year. He argued that American QE came at a higher point up the yield curve, meaning it could have a greater impact in lowering yields. On the other hand, he said Europe's credit markets are more heavily based on banks, with the possibility that they could simply hold onto their newfound liquidity rather than pass on the benefits. Just as importantly, Summers argued, US QE was unexpected and therefore gave confidence a sudden boost, whereas everyone expected Draghi to open the liquidity gates. The Euro had already fallen 5% over the last month to $1.16 in expectation of a glut of supply, dropping a further 3% immediately before the announcement to $1.55, indicating that QE had already to an extent been priced in. Summers' fellow Harvard professor Kenneth Rogoff shares his less than sunny view. He said that there was a 'depressing certainty' that Europe would return to crisis, and that markets didn't think central banks could create inflation any more. Former Bundesbank president and fellow Davos attendee Axel Weber agreed, saying Draghi would not succeed in generating inflation 'however many bonds he buys'. The reason perhaps is that Europe's problem is not one of credit, as America's and Britain's were, but of structural, labour market weaknesses in countries like France, Italy and Spain. As a result, the European economy may not recover as hoped, no matter how hefty the ECB's measures are. Indeed, Greece's potential exit from the Euro after next week's election would could more than cancel out any benefits from QE. Whether €720bn a year will be enough to remedy Europe's ailing economy remains to be seen, but at least now no one will be able to accuse Draghi any longer of not trying.